For larger size LED fixtures or light sources with higher flux levels the BTS2048-VL spectroradiometer can be combined with a large size integrating sphere. The BTS2048-VL mounts to the integrating sphere port frame with set screws. This offers the flexibility to use the device by itself or combined with other accessory parts depending on the application. All integrating spheres are supplied with auxiliary lamps to compensate for the self-absorption of the test sample (substitution error correction). The auxiliary lamp can be manually operated with other lamp power supplies or under remote control operation with Gigahertz-Optik's BTS256-LED-ALP power supply. Either way the substitution error correction routine is supported by the S-BTS software supplied. The software also controls all measurement functions with the add-on sphere. 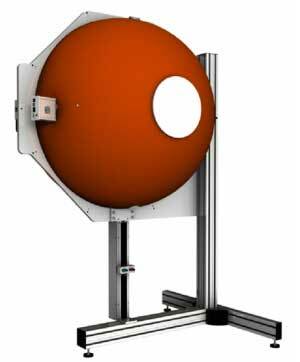 Calibration of the BTS2048-VL spectroradiometer with the add-on sphere is performed in Gigahertz-Optik's calibration laboratory for light measurement quantities against calibration standards traceable to national and international metrology laboratories. Re-calibration is recommended every 12 months. 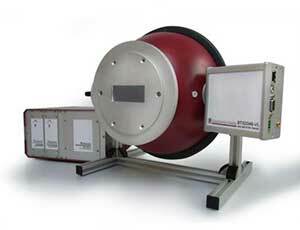 For in-house end-user re-calibration calibration standard lamps are available. The re-calibration routine is supported with the supplied software. Integrating Sphere with 250 mm / 10 inch diameter for 2π or collimated emitting LEDs or light sources. Measurement port with 35 mm diameter with protective window. Detector port that accepts the BTS2048-VL spectroradiometer. Auxiliary lamp. Bench-top stand. Calibration in luminous flux and spectral flux. Meets the requirements of CIE 127 for luminous flux measurement of directional (2pi) LEDs. A temperature sensor and diffuser window are also included. For product specifications for the ISD-25-BTS2048-VL, please visit the Gigahertz-Optik main website here. 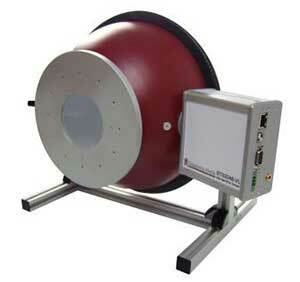 Integrating Sphere with compact 150 mm / 6 inch diameter for 2π or collimated emitting LEDs or light sources. Measurement port with 76.2 mm diameter with protective window. Detector port that accepts the BTS2048-VL spectroradiometer. Auxiliary lamp. Bench-top stand. Calibration in luminous flux and spectral flux. 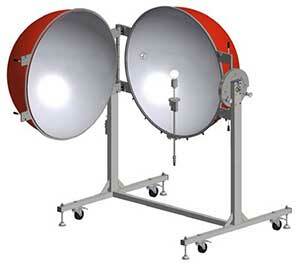 Suitable for system integration into front-end and back-end LED test systems. For product specifications for the ISD-15-BTS2048-VL, please visit the Gigahertz-Optik main website here. Integrating Sphere with 1000 mm / 39 inch diameter for 4π, 2π or collimated emitting LEDs or light sources. Measurement port with 254 mm diameter. Detector port to accept BTS2048-VL spectroradiometer that is baffled to the measurement port. Auxiliary lamp. Bench-top stand. Calibration in luminous flux and spectral flux. Meets the requirements of CIE 127 for luminous flux measurement of both directional (2pi) and omnidirectional (4pi) light sources and LEDs. For product specifications for the ISD-100HF-BTS2048-VL Integrating Sphere, please visit the Gigahertz-Optik main website here. 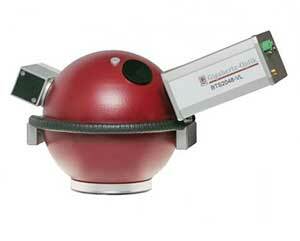 Rotatable integrating Sphere with 1000 mm / 39 inch diameter for 4π, 2π or collimated emitting LEDs or light sources. Measurement port with 254 mm diameter. Detector port to accept BTS2048-VL spectroradiometer that is baffled to the measurement port. Auxiliary lamp. Bench-top stand. Calibration in luminous flux and spectral flux. For product specifications for the ISD-100HFT-BTS2048-VL Integrating Sphere, please visit the Gigahertz-Optik main website here. Lateral emitting light guides are now deployed in daytime running lights, tail lights and brake lights in the automotive industry. Gigahertz-Optik's TFCT25 measurement system can be used to measure the different optical transmission parameters, including light guide 'yellowing' and the LED lamps. The system is based on a combination of the ISD-25 and BTS2048-VL. For product specifications for the TFCT25, please visit the Gigahertz-Optik main website here.